Bollgard: A single-gene trait which expresses the Cry1Ac protein from Bacillus thuringiensis (Bt) and provides resistance to certain lepidopteran pests such as tobacco budworm. Abbreviated B or BG in variety names. Bollgard II: A two-gene trait which expresses the Cry1Ac and Cry2Ab proteins from Bacillus thuringiensis (Bt) and provides resistance to certain lepidopteran pests such as tobacco budworm. Abbreviated BII or B2 in variety names. Bollgard III: A three-gene trait which expresses the Cry1Ac, Cry2Ab and Vip3A proteins from Bacillus thuringiensis (Bt) and provides resistance to certain lepidopteran pests such as tobacco budworm. Abbreviated BII or B2 in variety names. Commodity Credit Corporation: An entity administered by the Farm Services Agency of the United States Department of Agriculture. Commonly abbreviated as CCC. Color: See HVI Color Grade. Conventional tillage: Systems in which the entire surface layer of soil is mixed or inverted by plowing, power tilling, or multiple disking before planting. Conventional tillage systems may also involve inter- row cultivation after planting. County Standard Test: A large plot variety trial consisting of no-replications and only commercially available cotton varieties. Abbreviated as CST. Coefficient of variation: A statistical estimate of experimental variability, calculated as the standard deviation divided by the mean, and expressed as a percentage. A relatively low CV indicates greater experimental precision. Abbreviated as CV. Earliness: A measure of how rapidly a cotton crop reaches maturity. Relative earliness of varieties can be measured by the heat units needed to mature the highest harvestable boll. Earliness is under genetic control but is strongly influenced by crop management. Gin turnout: Weight of lint as a percent of seedcotton weight, which is composed of lint, seed, trash, and excess moisture. Glytol: A trait which provides tolerance to the herbicide glyphosate. Abbreviated G in variety names. Heat Units: A measure of thermal time used to describe crop growth and development. Commonly abbreviated as GDD (growing degree days) or DD60s (degree-days above a threshold of 60° F). High Volume Instrument: A classing instrument providing accurate measurements of fiber length, strength, micronaire, length uniformity, trash, and color. Abbreviated as HVI. HVI Color Grade: Cotton color grade is a function of white reflectance (Rd) and yellowness (+b) of the lint sample. The HVI color code identifies the quadrant of the Nickerson-Hunter cotton colorimeter diagram in which Rd and +b values intersect (USDA, 1999). Color may be affected by moisture and temperature after boll opening, during harvest, ginning or storage. Height to Node Ratio: A ratio of the main stem height divided by the total number of nodes. This measurement can provide insight into vegetative vigor. Leaf Grade: The classer’s leaf grade is a visual estimate of the amount of cotton plant leaf particles in a sample of lint. There are seven leaf grades represented by physical standards, plus a below grade designation. See Trash. Length: Average fiber length of the longer one-half of the fibers sampled, in hundredths of an inch. Fiber length is under strong genetic control but may be reduced by environmental stress, nutrient deficiency, or fiber breakage. Staple expresses fiber length in 32nds of an inch. Lint yield: Weight of lint harvested per unit ground area (typically reported as pounds per acre). Liberty Link: A trait which provides tolerance to the herbicide glufosinate. Abbreviated LL in variety names. Least significant Difference: Least significant difference is the statistical estimate of the smallest difference between two means that are significantly different at a fixed p-value (usually 0.05). Micronaire: A measure of fiber fineness or maturity. An airflow instrument measures the air permeability of a given mass of cotton lint compressed to a fixed volume. Low “mike” values indicate finer or less mature fibers. Mike is strongly influenced by boll load, leaf retention and environmental conditions (especially moisture supply) during boll maturation. Abbreviated as mike or mic. 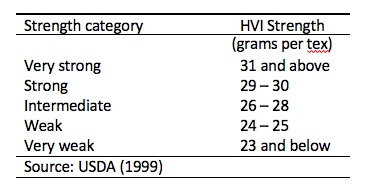 No decimal point is used by the USDA (1999) in reporting micronaire values, while others report values in tenths of units. Nodes above cracked boll: A measure of plant maturity measured by the number of nodes from the highest first-position cracked boll to the node of the highest harvestable boll. Abbreviated as NACB. Nodes above white flower: A measure of the number of main-stem nodes above the uppermost white flower at first position, indicating relative crop maturity. An average NAWF count of 5 is used as a reference point of physiological cutout or last effective boll population. Abbreviated as NAWF. No-till: A system in which a crop is planted directly into a seedbed not tilled since the previous crop and only the immediate seed zone is disturbed during planting. Other surface residues are not moved, and weed control is accomplished primarily with herbicides. Official Variety Trail: A replicated small-plot test conducted at several locations to evaluate the adaptation of the most promising commercial cultivars for Tennessee. Abbreviated as OVT. P-value: Observed significance level in an analysis of variance. It estimates the probability of error in concluding that differences truly exist among treatments (varieties). Randomized Complete Block Design: An experimental design in which all treatments are randomly assigned to plots in separate within-field blocks (replications). This design increases the power of the trial to isolate treatment differences from inherent field variability. Rd and +b: Measures of white reflectance (%) and of yellow pigmentation (Hunter’s scale), respectively, in a sample of lint. Lower Rd values indicate grayer samples, while higher +b values indicate yellower samples. Field weathering can decrease reflectance, while excess moisture in storage can cause yellowing. Roundup Ready: A trait which provides tolerance to a broadcast application of the herbicide glyphosate until the fifth true leaf reaches the size of a quarter. Subsequent glyphosate applications must be directed towards the base of the plant. Abbreviated R or RR in variety names. Roundup Ready Flex: A trait which provides tolerance to a broadcast application of the herbicide glyphosate beyond the fifth true leaf stage. Abbreviated F or RF in variety names. Seedcotton: Lint plus seed, trash and excess moisture. Staple: A traditional term applied to lengths of fiber that require spinning or twisting in the manufacture of yarn. Staple also refers to the average length of the bulk fibers measured in 32nds of one inch. Cotton fiber considered with regard to its length. Strength: Force required to break a bundle of fibers one tex unit in size. A tex is the weight in grams of 1,000 meters of fiber. HVI clamp jaw spacing is 1/8 inch. Fiber strength is under strong genetic control, but may be reduced by nutrient deficiency or stress. Transgenic variety: A variety containing genes from dissimilar species or other foreign sources that confer desirable traits such as insect or herbicide resistance. Twinlink: A two-gene trait which expresses the Cry1Ab and Cry2Ae proteins from Bacillus thuringiensis (Bt) and provides resistance to certain lepidopteran pests such as tobacco budworm. Abbreviated T in variety names. TwinlinkPlus: A three-gene trait which expresses the Cry1Ab, Cry2Ae, and Vip3Aa19 proteins from Bacillus thuringiensis (Bt) and provides resistance to certain lepidopteran pests such as tobacco budworm. Abbreviated TP in variety names. Uniformity: Length uniformity is the ratio between the mean length and the upper-half mean length of the fibers, expressed as a percentage. Also referred to as the length uniformity index. Widestrike: A two-gene trait which expresses the Cry1Ac and Cry1F proteins from Bacillus thuringiensis (Bt) and provides resistance to certain lepidopteran pests such as tobacco budworm. Abbreviated W in variety names. Widestrike 3: A three-gene trait which expresses the Cry1Ac, Cry1F, and Vip3A proteins from Bacillus thuringiensis (Bt) and provides resistance to certain lepidopteran pests such as tobacco budworm and improved resistance management. Abbreviated W3 in variety names. XtendFlex: A trait which provides tolerance (in cotton) to the herbicides dicamba, glyphosate, and glufosinate. Abbreviated XF in variety names.